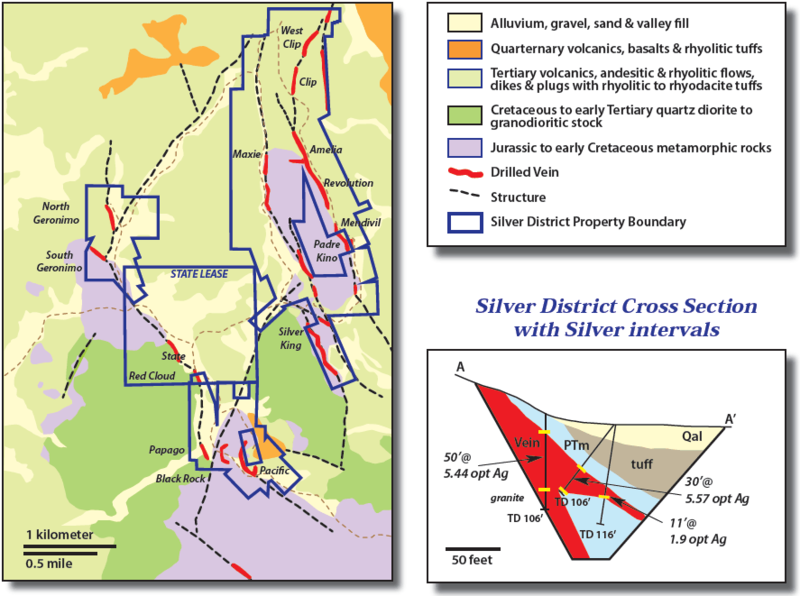 The Silver District Project is an advanced-stage exploration project located in southwest Arizona. Magellan’s Silver District Project in La Paz County holds promising potential for expansion of a historic 16 million ounce silver resource, and development of a silver mine with by-products fluorspar, barite and lead-zinc. 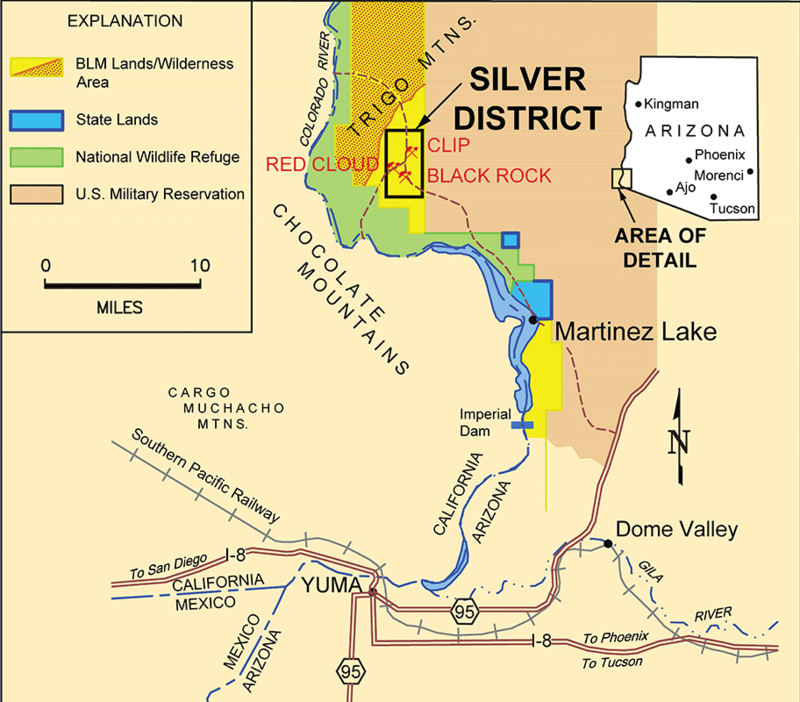 The property consists of over 2,000 acres of patented and unpatented mining claims and an Arizona state exploration permit, and covers all of the important historic mines and prospects in the Silver District. Mineralization is controlled by three principal sub-parallel north-northwest trending epithermal vein systems cutting Tertiary volcanic rocks underlain by basement metamorphic rocks. The three vein structures extend over a collective strike length of eight miles. 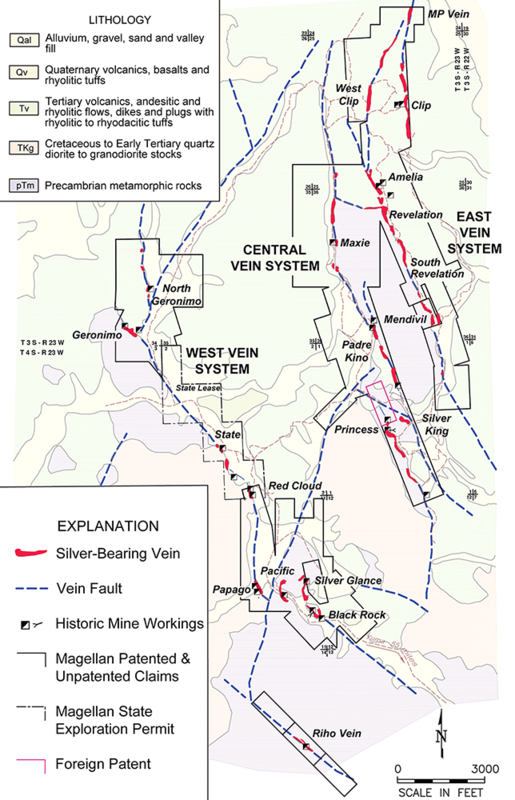 Potential ore-grade deposits containing silver, lead-zinc, fluorspar and barite occur along the veins in pod-like bodies commonly 15-50 feet or more wide and hundreds of feet long. From 1973-1992, New Jersey Zinc Company and Orbex Minerals Ltd. and its successor companies drilled 465 shallow holes for an aggregate length of 62,866 feet, conducted metallurgical test work and carried out scoping studies. In 1991-1992, using polygonal methods, silver mineralization was estimated as 3.56 million tons grading 4.46 opt silver (15.9 million contained ounces silver), and fluorspar mineralization was estimated as 2.3 million tons grading 14.5% CaF2 (328,450 tons contained fluorite). Included within this mineralization, substantial tonnages grade 17.0% barite (BaSO4) and 3.57% lead-zinc. These historic estimations of mineralization do not constitute a reserve estimation. Magellan’s first priority in advancing the Silver District Project will be to conduct additional drilling with the objective of expanding the known resources. Previous drilling on the veins was entirely in the oxide zone and extended only to 130 ft shallow open pit depth. Mineralization is open below that depth. There appears to be excellent potential to increase resources with deeper drilling of oxide and possibly underlying sulphide mineralization. There also is promising potential to expand the near-surface oxide mineralization through drilling strike extensions of known deposits and previously untested vein segments. In 2014, Magellan drilled three holes, one of which was designed to confirm results of historic drilling. Magellan’s hole PA-01 intersected 90 feet grading 6.05 opt silver (including 10 feet of 17.06 opt silver), which compares favourably to the historic result. PA-01’s 90-foot intercept also returned previously unreported zinc-lead values averaging 4.71% zinc and 1.56% lead over the 90 feet, including 10 feet grading 8.35% zinc and 4.02% lead. Conceptual development schemes by past operators have involved multiple open pits feeding a central mill. Flow sheet designs employ fine grinding and cyanide leaching to recover silver, and conventional flotation to recover fluorspar and barite. Substantial additional work will be required in order to determine the feasibility of developing a new mine. Among other items, the work will need to include drilling, reserve estimation, metallurgical studies, mine and plant design and engineering, marketing studies and assessment of permitting issues. Until that work and a positive feasibility study is concluded, there can be no assurance that the property contains commercially recoverable minerals.